The 2018 Cadillac XT5 crossover is sleek and luxurious. On the outside, a stylish design turns heads down any road. Chiseled lines and smooth curves house bright, distinctive lighting. LED Cornering lamps are available, as well as LED IntelliBeam headlamps that can automatically toggle between low and high beams as you pass other vehicles and forge your own path. The door handles of the XT5 can illuminate when you unlock them so that you can see your door handle in the dark. The XT5 is available in eight exterior color options. Inside the XT5, comfort is a priority. Authentic materials line the cabin, like natural wood, and leather appointments and suedes. Every detail was well-thought-out, from the materials to the design. The seats in the XT5 enjoy generous legroom, and the leather-wrapped steering wheel is available with heating functions to up the driver's comfort level. The rear seats fold flat to transform your space and reach 63 cubic feet of cargo space, and an available UltraView® Sunroof stretches across both rows of seating to keep the cabin feeling bright and breezy and to allow all passengers to enjoy the view! The XT5 has advanced safety systems implemented to give you confidence behind the wheel and keep your focus on reaching your destination. Lane Keep Assist with Lane Departure Warning helps you stay in your marked lane by using steering assist technology to gently guide you back when it senses you drifting across road markings. Lane Change Alert with Side Blind Zone Alert helps you check your blind spot when you indicate to change lanes to ensure it is clear before you move. A rear vision camera shows you HD video behind you when your vehicle is in reverse to give you a less obstructed view to help you back up safely. The XT5 also offers Surround Vision, which provides a bird's eye view around your vehicle when you are driving at low speeds in drive or reverse. This view helps give you a holistic view of your surroundings to ensure your safety. 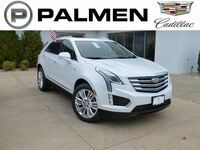 The 2018 Cadillac XT5 is available now at Palmen Buick GMC Cadillac. Browse our inventory and set up a test drive online today! Interested in a Cadillac XT5?